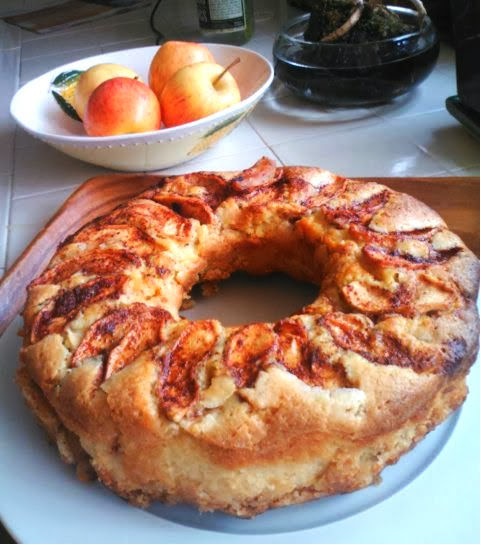 My mother used to make an apple cake, she loved it, and she did lay out the apples nice and pretty like with this one, there are very few exposed apple baked goods I like, the apples usually look dried, sort of pale and poorly. Mix apples with sugar and cinnamon in a small bowl and let them hang out, so the juices run a little. In a mixer, mix oil and sugar. Add lime juice, (or lemon if that's what you have on hand, or anything else that's acidic, you need something for the baking powder to react with.) Add vanilla and eggs. Add dry ingredients to the wet and mix until incorporated. Then the rest of the dough and lay out the walnuts. Pour any remaining juices over the top, helps bring out the color. Wait until it cools to flip it out, helps prevent cracks where the inner layer of apple lies. This is one of those cakes that just makes you think, yup I'm home. There's something about fall produce that does that. So I needed to take something to a potluck, and three eban salad is both easy to put together, and travels pretty well. Although I did break out my chilled travel bowl so it would make it there, and not need the fridge. It's pretty cool., literally, Take a look. This altered recipe all started because I don't like green beans, not really, but I still wanted something green, and it should be a bean, edamame just seemed like a good choice. Now, since we're talking about beans, there's also the not so pleasant subtopic of the gas it creates. There are two basic schools of thought on how to deal with, the sugar route and the cumin route. Pretty much every 3 bean salad recipe goes for sugar, except this one. Cumin, to make up for the lack of sweetness, I threw in a little corn. To make the salad, combine. You can dress this salad early, the celery will stand up well enough to last a couple of days. Serving tip: I usually place the dressing at the bottom of the bowl and miz when ready to serce. Happy Easter everyone. I thought I would share a few photos from around the house, since it was all festive for the occasion. These are the chocolate eggs, chocolate rabbit, and oh so cute chocolate carrots I "found" on Amazon. These are the real eggs. The lighter colored ones are "marbled eggs" what we do is color the eggs a base color, and then a little oil to all the colors and redye. The oil sticks to part of the shell and gives this multi-colored look. It's something my mom read in Martha Stewart Living years and years ago. Here's a link to last year's blog entry. The really really dark egg, which I have been trying to get to happen forever, is actually a brown egg in old regular food coloring dye. That's it, the great secret, brown eggs can be colored deep dark beautiful colors. So now you know as well. I also sprouted some lentils, I started late, I was out of the green lentils, so they didn't quite make it in time. I'm planning on planting some, seeing what happens. All you have to do to get these to sprout, is wet a paper towel, place in a bowl top with some lentils and wet a little every day. It takes around a week and a half for a decent, edible growth. Then you can place them in sandwiches or just plant them in the garden, 4 inches apart. Probably shouldn't plant quite this many. And here it is, the picture of the bread, choreg, I did in fact make them, they are basically finished we have one left, it was a pretty good year, if I do say so myself. You can check out the recipe for them here. Where have you been all my life Spinach and White Bean Soup? I'm back, I think, computer died a slow painful death, finally took the plunge and bought a new one, it was time, it's a Chromebook and although cool, really shouldn't be anyone's main computer, but I'll see, for now it's working out fine. So I don't like tomato based soups, not like this one. I like purees, and creamy soups. But this soup just changed my way of thinking. It's easy and quick, the longest part is cooking the onions. Cook the onion in olive oil until golden in color. Add tomato paste, mix . Add chopped tomatoes, broth, orzo, basil, chili flakes, salt and pepper. Bring to a boil, and simmer for ten minutes. Add beans and spinach and cook until spinach wilts. Adjust seasoning as needed. I did add meatballs after the fact. I used the frozen IKEA kind, around 15 minutes in 450 degree toaster oven. Not everyone is fan of these and I ask before placing in serving dishes. This is one of those rare soups that is best the first day, if you do need to cook it the day before, hold off on adding the spinach and the orzo until the day of.